The Sailors' Gate was built in the Middle Ages but its present appearance is a result of a major 19th-century reconstruction. Straddling the street that led to the port quay and St. Johns' parish church and the Old Town market square, the gate was the most important entrance to the city. It was here that Polish kings were ceremoniously greeted to the accompaniment of the great Tuba Dei bell. The mayors of Toruń handed the keys to the city gates to the sovereigns and invited them to stay at the royal chambers in the Town Hall. Owing to that tradition, the Żeglarska street (Sailors' street) used to be called the Royal Route. It was the widest street in the entire Old Town. 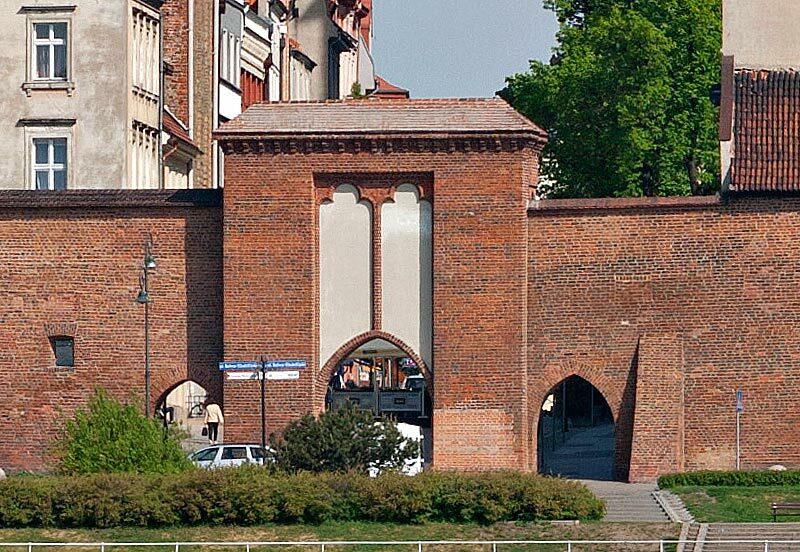 The earliest sources suggest that the first brick houses in Toruń were raised along that street as early as in the first half of the 13th century. Today, the street is still lined with numerous historical burgher's houses that used to be occupied by eminent burghers and noblemen. The vicinity of the Sailors' Gate are the only place within the city walls from which one can see the 15th-century clock mounted on the belfry of St. Johns' cathedral. Its painted and gilded tin face serves as background for the clock hand shaped like a human hand whose two fingers for centuries have been showing the passing hours. The clock is commonly referred to as a "raftsmen's clock" as it was placed on the tower so that it would serve the sailors, raftsmen and other people going about their business in the busy riverside port which was situated just behind the Sailors' Gate. In medieval Toruń the riverside quay was frequently visited even by sea-faring ships belonging to local and foreign merchants trading in copper, cloth, grain, salt, and forest products. Various merchandise, loaded with the use of a crane which used to stand by the river, were transported further on to the distant Flanders, England, northern Germany, and Sweden. The importance of the port in Toruń decreased as early as 15th century with the changes in trading routs and the increasing role of Gdańsk, but Toruń remained an important stopover place for the raftsmen going down the river. As recently as one hundred years ago, their rafts still stopped at the embankment and a large timber port was built for their needs a few kilometers down the river. Since the trading port was closed down after the end of the Second World War, the only ships that are moored here nowadays are tourist boats.